A fast, fun and inclusive musical activity to energize and unify your team! In Boom Time, participants create unified music with a Boomwhacker – a lightweight, hollow, color-coded, plastic tubes, tuned to musical pitches by length. This interactive team building game transforms any conference room into a bright and fast-paced orchestra that will engage, enthuse and energize everyone! We need a large space in a private, sound-proof conference room and a chair for each participant. Team tables are optional. We will also need a stage area at the front of the room with a large screen and HDMI compatible projector. If the group is larger than 50 people we will need a microphone and speaker setup, and strongly suggest a riser for an elevated stage. As with all TeamBonding events, we are happy to customize this interactive team building game by incorporating your company message into the introduction and debrief. For an additional cost and enough lead time, we can even put the song of your choosing into our specially designed program! 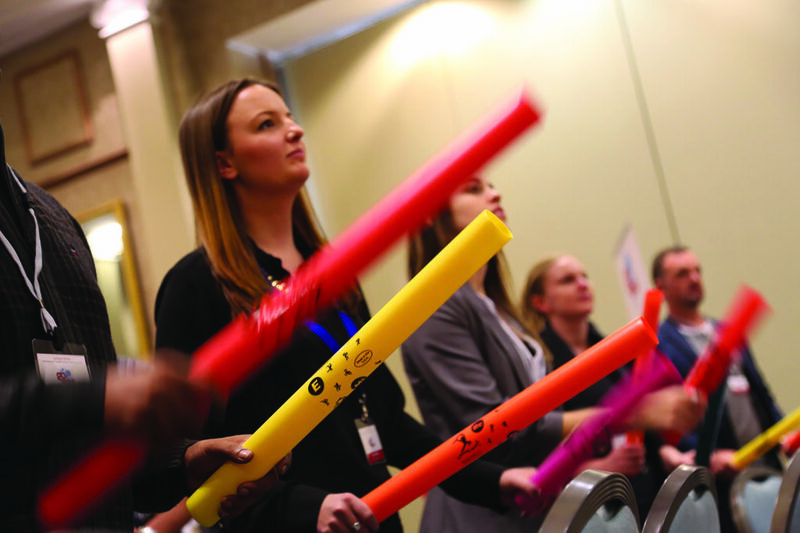 Armed with a Boomwhacker, Boom Time participants follow a visual interface which guides them in collaborating to generate a fiery symphony of music. The visual interface displays color-coded blocks across a large screen. Participants use timing and teamwork to strike their tubes and create musical notes each time a colored block hits a key. As the event progresses, the pace and complexity both grow; blocks move faster, and teams respond more vigorously to keep the rhythm building to an uplifting crescendo. Boom Time is a unique conference ice breaker or energizer that unifies teams as they create adrenaline-pumping music. Requiring involvement from all individuals, and collaboration as a group, this team building activity nurtures openness and teamwork. It’s a great way for people to de-stress and have fun with their colleagues. Boom Time has proven successful worldwide in igniting conferences and generating a sense of excitement and unity in a team.